From now through July 5 you can get five dollars off any order at all from The Retropolis Transit Authority, Saga Shirts, and Hot Wax Tees by entering the coupon code STARSAVINGS during your checkout. There’s no minimum order, so that’s five dollars off an order for a single shirt or, of course, thirty shirts, which you’re actually more likely to want. 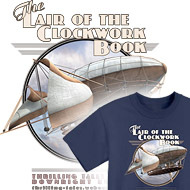 This includes those brand new (and extremely flattering) Thrilling Tales T-Shirts from The Lair of the Clockwork Book which, once you own them, will be the envy of all your friends and neighbors. Be the first on your block! Thrilling Tales: The Attack of the Merchandise of Annihilation! Along with all the other things I need to do as I work on these illustrations, at the end of each batch of them I re-render a few in a higher resolution in order to slap them on archival prints, t-shirts, and other gimcracks as Thrilling Tales merchandise at my Retropolis web site. 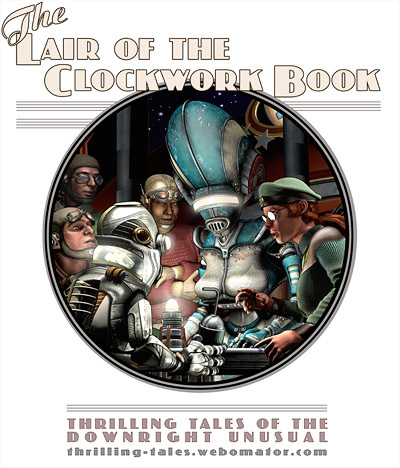 This time I was more clever than usual, in one way, anyhow: I set up scheduled renderings for about five of the new Clockwork Book illustrations – so that when I got to this point I’d only need to do the Photoshop work on them. That has helped. But these are likely to trickle out over the weeks since I’m also working away at the new illustrations for Part Two of The Toaster With TWO BRAINS. For now, anyway, I’ve added a couple of T-Shirts – The Astro Diner shirt shown above, and another shirt with Osgood Finnegan’s airship. In fact there are also diner mugs and airship mugs, along with a poster and an archival print of Late Night At the Astro Diner. Along the way I’ve noticed a subtle but annoying problem in one part of the Retropolis store. It’s not a problem for you – not functionally, anyway – but the breadcrumbs and sidebars aren’t doing the magical things they used to do. I have an idea why that is, but I can’t fix it at the moment. But there it is: some new bits of the Thrilling Tales on neat things, presented almost neatly. More to follow, if on an erratic schedule.